A new kind of heat exchanger recycles energy while cleaning pollution from the air. Read more on The Hindu Business Line and Yicai Global. One day in 2012, Audrey Keunebrock and Jaouad Zemmouri were on the French Riviera, looking out at the Mediterranean. Zemmouri, a research scientist, started thinking about the huge quantity of solar heat trapped in the sea, and wondered: how could that energy be transferred from water into air? Two years of research resulted in the Terrao heat exchanger, an innovative way to recycle thermal energy. Zemmouri and Keunebrock, a technology engineer, are partners in life and work. They run a seven-year-old company in northern France called Starklab, specialising in R&D for sustainable development. “Our global need for energy is increasing,” said Zemmouri. Since we must wean ourselves from fossil fuels, the only other energy solutions are green or recycled. The Terrao concept is simple – mix hot air directly with cold water, or cool air with warm water, and a transfer of energy will make the air the same temperature as the water. Traditional heat exchangers keep the warm and cool substances separate with metal sheets or tubes. Unlike Terrao, they cannot access all the energy in steam. Zemmouri said that while the physics was nothing new, the challenge was technical: “How do you inject a large volume of air or steam into water without displacing the water?” Think about blowing through a straw into a drink – the liquid flies everywhere. He discovered a way to make the water bubble, like a Jacuzzi, so that the exchanges could be controlled. After building a prototype in the couple’s garage, the startup did a pilot test at a horticultural high school, where energy was being wasted by simultaneous heating of the greenhouse and opening windows to ventilate it. The Terrao system forced cold outside air into stored rainwater that warmed and purified it, then used this air to ventilate the greenhouse. The school’s gas and electricity needs dropped by 45 percent. But that wasn’t all – when tested at a municipal swimming pool, the exchanger removed chloramines from the air. “Its strength,” said Zemmouri, “is the ability to treat pollution at the same time it recuperates energy.” They realised that Terrao’s two-in-one approach would make it ideal for cleaning noxious substances from factory emissions. 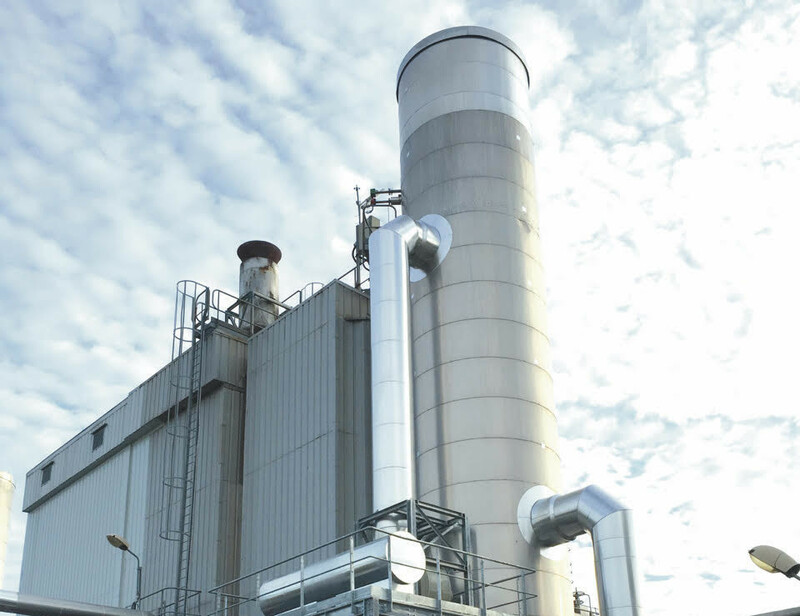 In 2016, following further research, the Terrao exchanger was ready to be tested on a waste incinerator. A stainless steel bypass attached to the chimney trapped hot fumes at the source and forced them into water before the incinerator could belch them into the air. The exchanger captured particulate matter (95 percent of PM10 and 80 percent of PM2.5), nitrogen oxides, sulfur oxides, CO2 and more. Trapped in water, these pollutants could then be treated using classic methods, while the energy from the fumes was recycled as heat. Keunebrock compares Terrao’s numerous applications to a Swiss army knife. The technology can treat emissions from factories and industrial boilers as well as air in office buildings and shopping malls. It can recycle energy to heat buildings or even cool them, as the company is starting to do in Dubai. Starklab has 10 international patents, and Zemmouri said a Terrao system for private homes should be perfected within three years. As the startup grows, its nomenclature can be confusing. Starklab remains the R&D heart of the group, while Terrao is the name of the heat exchanger technology. Terraotherm is a subsidiary and application for treating air, and Terraosave treats hot industrial emissions. Recently, Terraotherm was selected as one of five companies to test its methods in underground public transportation stations in Paris. Next year, commuters at the Avenue Foch station will see its stainless steel blocks – like large refrigerators – at either end of the quay, filtering noxious fumes and fine particles out of the air. The installations are indeed expensive, notably Terraosave, where a single contract can be worth a million euros. But the startup claims it can reduce energy bills by 30 to 80 percent, which generally pays for its cost in less than three years. “The market for Terrao’s applications is enormous,” said Keunebrock. “Heating, energy recovery, industrial equipment – we are talking billions of dollars, globally.” Rather than receiving financing from investors, the startup chooses to grow through licencing, partnerships and sales. “We have been profitable since the beginning,” said Zemmouri. Last year the group’s turnover was 2.2 million euros, this year it will approach 6 million, and the target is 15 million euros in 2020. In order to focus on R&D, the company is expanding via partnerships with professionals who know their markets best, such as Dalkia, a subsidiary of Electricité de France. The startup has used this strategy to enter markets in Europe, Dubai and Morocco, and it is looking for a reliable partner in China.